While I legitimately enjoyed all of our guest lectures at the Centro de Estudios Martianos during this trip, my favorite was, unsurprisingly, Rubén Moro’s guest lecture on different styles of Cuban music. My musical studies at UMass Lowell have emphasized the importance of text to Western musical practice, but not to so great an extent the importance of dance. Considering that we had a separate dance class, I was a bit surprised to see just how much Rubén incorporated dance into the music class. In hindsight, perhaps I should not have been surprised; Cuban music and dance cannot be divorced. The popularity of a piece of culture does not necessarily predict its ability to endure, and it appears to me that multiple factors have coalesced to make Cuban musical traditions both popular and enduring. The United States has seen many dance fads gain brief popularity only to be immediately forgotten. What sets Cuban song and dance apart is Cuba’s stronger sense of a national cultural identity. José Martí wrote of Cuba’s need to remain independent of any other country, and the persistence of this Martinian ideal has resulted in the embrace and preservation of those cultural elements considered uniquely Cuban. Another important point of contrast to consider is the diversity present within each style of Cuban dance, with composers exploring the possibilities of each dance’s respective rhythms across many songs; at least in recent decades, American dance crazes typically revolve around a single recording. The Cuban musical tendency towards a strong national identity extends to instrumentation, and the music of Cuba thoroughly incorporates a number of instruments seldom found in the United States, such as the tres, one of which I was able to acquire during my trip and bring back to Lowell. 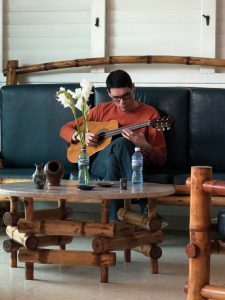 In a manner suggestive of the close ties of Cuban music to dance, stringed instruments such as the tres and laúd tend to play syncopated arpeggiations rather than the strummed harmonies of a guitar. I haven’t had much time since returning to Massachusetts to immerse myself in the technique and literature of the tres, but I certainly hope to be able to incorporate it into my ensemble performances during my time at UMass Lowell. Here I am experimenting on the tres that I was fortunate enough to bring back to the U.S.
Rhythmic notation of the punto clave. Rhythmic notation of the cinquillo cubano. Being a jazz musician, I’ve pondered why America’s classical music doesn’t have the same sort of mainstream appeal anymore as traditional Cuban music, and I have arrived at a few conclusions. Swing music, intimately connected to swing dance, was the “pop music” of its day. Bop artists like Charlie Parker intellectualized the idiom of jazz, distancing it from its roots as dance music. Without any socio-political reason to hold onto swing, and with artists like Ornette Coleman and John Coltrane pushing the boundaries of jazz further and further, it was inevitable that jazz would lose popularity despite achieving higher and higher levels of artistic greatness. In other words, despite the great beauty of bebop and free jazz, the people who most fully understood and enjoyed them were always going to be other musicians. Cuban music never strayed from dance, and in never straying from dance it never strayed from its mainstream appeal. Despite the brevity of his lecture, Rubén Moro did manage to change my perspective on musical evolution. That, and after his demonstration of the dance to the guaguancó, I will never be able to hear the word “vaccination” quite the same way again. This entry was posted in Uncategorized by christopher_winters@student.uml.edu. Bookmark the permalink.